In the winter and summer, it seems like saving money is generally out of the question. When it comes down to it, it always seems like our home is never heated or cooled evenly and it seems like our bill is always exorbitantly high. However, you should never underestimate the power of weatherstripping. Properly weather proofing and weatherstripping your home can prepare your abode for the extreme temperatures, so that you don’t have to spend a fortune utility bills and so you can feel comfortable in your own home. Not to mention, there is also a good chance that you will have guests, which means that you want to keep your home a nice, even temperature. Here are some winter and summer weatherstripping tips to save you money. Don’t re-insulate your entire home – just the attic. In most cases, you probably only need to re-insulate the attic – not the entire home. If a company recommends insulating the entire home, you can ask them if you really need it or not. In most cases, just your attic needs re-insulation. The reason for this is simple: According to Fahrenheit Inc not having enough insulation can allow air to escape, which can cost you money when you are blasting your HVAC unit. Look for leaks in your basement. When it comes to weatherstripping, you generally want to look at your windows and door frames for any signs of air leaks. However, it is also important to inspect the basement too. The basement can literally be full of air leaks – in the walls, windows and the foundation. So, you want to make sure to use an epoxy resin to close these leaks. Air leaks in the basement can cause your home to be cooler than it is in the winter and warmer in the summer, which can be very uncomfortable. Make sure that you add weatherstripping to your doors. There is usually a one inch gap under your door frames that allows air to escape and when you are blasting your HVAC unit, it can cause you to waste all that warm or cool air. If you are trying to warm your home in the winter, you may notice your HVAC unit working harder if you don’t have weather strips under your door. You can usually find these weather strips at your local hardware store or home supply shop. Use caulking to seal your window frames or any leaks in walls and doors. 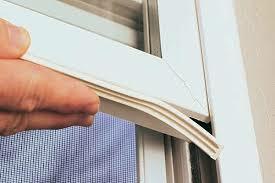 If you hold your hand over one of your doors or window frames, you will notice an air leak coming out here and there. You can usually feel it with your hands, but it may take the use of a candle to detect minor leaks. All you need is some caulking to seal these leaks. Caulk and weatherstripping go hand in hand to fight air leaks. Conduct an energy audit of your home. Conducting an energy audit will give you a good idea of where you need to save energy the most. Doing this will allow you to effectively weatherstrip your home with the most success – so that you can save the most money.